Tiësto release, ‘Light Years Away’, featuring DBX, is the latest track from his fifth full-length artist album ‘A Town Called Paradise’, which is out now on Casablanca Records/ Republic Records/ Musical Freedom. A package of remixes has just been released featuring all new interpretations of the track from Tiësto & MOTi, Oliver Heldens, Skyden, Hey Hey, David K and more. 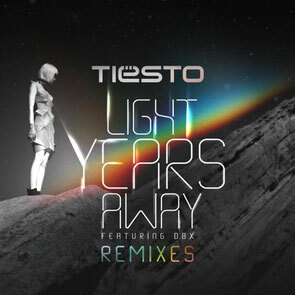 ‘Light Years Away’ is the follow up to Tiësto’s first Top 40 airplay hits in the US – ‘Wasted’ and ‘Red Lights’. Both singles have also achieved Gold status as certified by the RIAA for digital sales in excess of 500,000; Tiësto’s first Gold plaques in the States. Tiësto also continues his run of songs in the movies as ‘Let’s Go’ will be used in Night At The Museum 3 (release date 19 Dec); following ‘Wasted’ which appeared in 22 Jump Street. Check the mixes out below.